Unmistakably a Jeep, the new Renegade has the distinctive front nose with the Jeep grille and round headlights. Chunky lines follow a steeply raked windscreen and a high roofline, with a sharp drop over the Renegade’s classy rear-end. 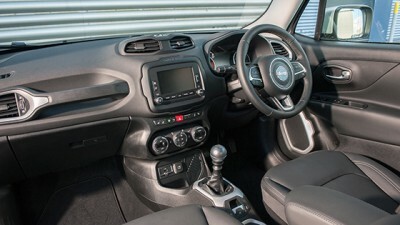 As a small SUV, the Jeep Renegade does very well at creating a good amount of space inside the well-equipped cabin. All the family will enjoy the great view from any of the five seats. The cabin is cleverly designed to maximise the amount of rear leg room, while the seats are well cushioned and offer good support for a long day out on the trail. 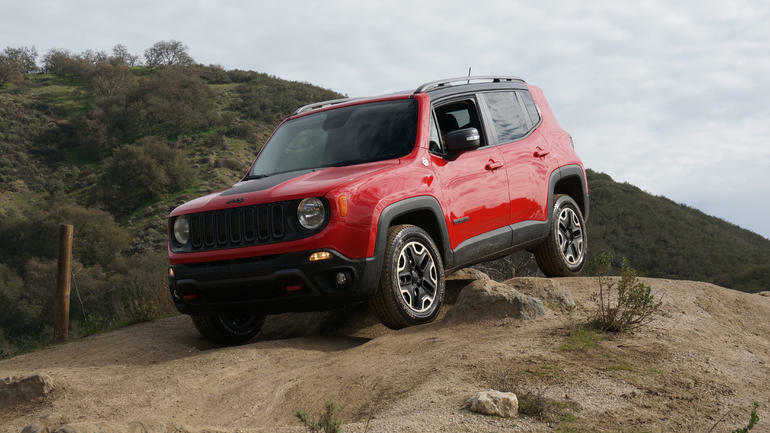 I say trail, because the Jeep Renegade Trailhawk is very good off-road. Off-road credentials start with Jeep’s Active Drive Low 4×4 system. Having the ability to drop down to low range gearing means that the Jeep Renegade can tackle some pretty serious stuff beyond what most everyday people will ever want to go. The Renegade performs well, and features both a single speed power transfer unit and disconnecting rear axle. What is noticeable, or not-so noticeable, is the seamless interchanging that goes on between two-wheel and four-wheel drive. For reasons of even better fuel efficiency, Jeep has made the rear axle able to disconnect from the front axle when conditions are easy. When 4×4 is needed, the system instantly locks in the rear axle with the front drive and enhances handling and traction. The Jeep Renegade offers a class exclusive nine-speed automatic transmission. Each Jeep Renegade that is equipped with the 2.4-litre Tigershark engine profits from this transmission. Smooth, torque–ready performance is the hallmark of this set-up. The 1.4-litre MultiAir Turbo engine links with a six-speed automatic transmission for great performance and efficiency. The 1.6 E-torQ engine boasts the new light-and-easy five-speed manual transmission, and the benefits of this drive is the reliable, efficient performance with good acceleration and excellent top-end power. Jeep Renegade Sport models come with the choice of either the 1.6-litre, 81 kW,153 Nm or 1.4-litre, 103 kW, 230 Nm engines. Opt for the very well-priced Renegade Sport model, and the result is a top package that includes: Uconnect radio with a 5-inch touchscreen display, integrated voice command with Bluetooth, seven airbags, steering wheel audio controls, cruise control, an electric park brake, a 4-speaker audio system, a reverse parking camera, 16-inch alloy wheels, premium cloth upholstery, black door handles and black exterior mirrors. For under $30k this is a real steal when you consider the nice city ride and the capability when you head off-road. The Jeep Renegade Longitude model boasts the 1.4-litre, 103 kW MultiAir Turbo engine. Features for this model include:, blind spot monitoring, a reverse parking camera, a leather wrapped steering wheel, dual-zone air conditioning, rear parking sensors, automatic headlights, rain sensing windscreen wipers, an electro-chromatic rear vision mirror, a six-speaker audio system, 2-way electric lumbar adjustment on the driver’s seat, 17-inch alloy wheels, front fog lights, black roof rails, body colour mirrors and body colour door handles. All of this results in a super nice compact SUV that will satisfy the needs of the adventurous buyer who likes a solid level of equipment for the journey. The Jeep Limited has all the luxury items and thus includes: Uconnect radio with a 6.5-inch touchscreen display, integrated voice command with Bluetooth, satellite navigation, Bi-xenon headlights, a 7-inch colour TFT instrument cluster display, a nine-speaker BeatsAudio system, a power eight-way adjustable driver and front passenger seats, heated front seats and steering wheel, 18-inch alloy wheels, full leather upholstery and deep tint privacy glass. The roof rails, exhaust tip, grille and mirrors boast a bright finish. It also is powered by the 1.4-litre petrol engine. For ultimate off-road performance, the Jeep Renegade Trailhawk uses the 2.4-litre Tigershark petrol engine that is an in-line four cylinder. Power is rated at 129 kW and torque is a healthy 230 Nm. Features for the Trailhawk model include: a nine-speed automatic transmission, Jeep Selec-terrain with Active Drive Low, Hill Descent Control, four underbody skid plates, a full-size spare – steel wheel, 17-inch off-road alloy wheels, Trailhawk leather upholstery, a black anti-glare hood decal, Trailhawk front and rear fascia, ‘Trail Rated’ badging, a black front grille, a rear red tow hook and, mirrors and badging in an accented colour. When matched against rivals in the form of the Honda HRV, Mazda CX-5, Mitsubishi Outlander and Hyundai Santa Fe, the Jeep Renegade is a standout performer – particularly when off-road ability is taken into account. For any more information on the Jeep Renegade or, for that matter, any other new car, contact one of our friendly consultants on 1300 303 181. If you’d like some fleet discount pricing (yes even for private buyers! ), we can submit vehicle quote requests out to our national network of Jeep dealers and come back with pricing within 24 hours. Private Fleet – car buying made easy!